We are living in what has been termed a ‘century of disaster’; round-the-clock media coverage gives the impression that one crisis or disaster follows swiftly on the last, resulting in an atmosphere that invites the exploitation of fear. This project examined how consumer products, applications, urban defence furniture and protected spaces, that help to prevent catastrophes and manage the aftermath thereof, can also amplify our fears. These ‘disaster designs’ shape our physical environment and society’s psychological condition, both of which are increasingly defined by anxiety. The research uncovers how design is implicated in the growth and pervasiveness of a generalised paranoia and details how the same mechanisms that are used in politics and media to commodify disaster and create a sense of emergency are being used within design. The research led to the creation of a concept store called ‘What are you Afraid of?’. 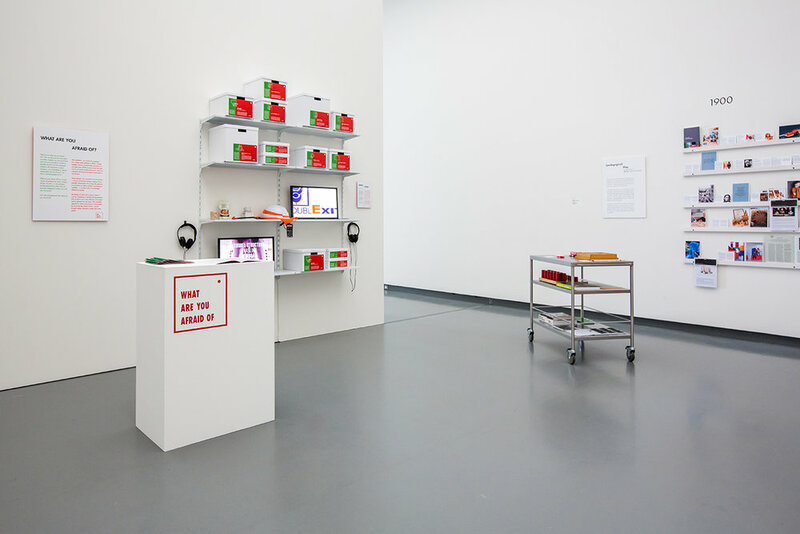 The store, both an analogue exhibition and a digital web store, offers the audience a platform to discover through shopping their own personal fear. A colour-coded system in green and red gives the opportunity to view the disaster designs on display from two perspectives: green embodies the store’s voice that uses researched and analysed advertising strategies; red enables an external critical reading of the objects and their fear-mongering effects. The current escalation in natural and technological disasters as well as terrorist attacks in Western countries has opened a lucrative new market for design. Designs, including consumer products, warning and communication applications, civic defence furnishings and protected spaces, are oriented towards threats and attempt to prevent catastrophes and manage the aftermath thereof. By protecting, they shape the physical environment as well as society’s psychological condition, one that is increasingly defined by anxiety. This thesis unravels the systems and motivations behind the growing number of objects and applications designed to mitigate disaster. It suggests that this sector of the design industry is in the business of fear-mongering. By selling a feeling of safety in an environment filled with undefined and elusive threats, this field of design is complicit in a form of mass psychological manipulation. The thesis provides insights into the design mechanisms deployed to influence the user of disaster-focused devices, playing on the customer’s vulnerability and fear for the sake of commercial success. In contrast with most design, which aims to fuel consumer desire and is intended for the present or near future, designing for disaster means designing for what is unwanted and for something that happened in the past, such as the SOS Parachute created to escape high-rise buildings that was designed after 9/11. The thesis uncovers the contribution of design to the growth of what has been termed ‘disaster paranoia’ and how design uses the same mechanisms as politics and the media to commodify disaster and create a pervasive sense of emergency.